Die Villa Lefki ist eine sehr geräumige Villa, perfekt für Menschen die großzügige Räumlichkeiten bevorzugen. Sie ist ideal für eine Familie von 4 bis 6 Personen oder auch für 2 bis 3 Paare. Die Villa bietet weite, offene Räume, ein großes Panoramafenster im Wohnzimmer mit hervorragendem Blick auf den Sonnenaufgang, das weite Meer und die Segelboote, eine riesige Terrasse mit Grill und Außendusche, einen großen Pool (12 Meter Länge), geräumige Schlafzimmer (zwei Schlafzimmer mit Bad en Suite) und eine große Küche, die auf dem letzten Stand der Technik ist. Diese Villa bietet allen Gästen viel Platz und ist für jeden ideal, der einen stressfreien, entspannten Urlaub genießen möchte. Jeder Raum ist mit einer Klimaanlage ausgestattet. Der Eingang, sowie das Erdgeschoß und auch die Terrasse sind barrierefrei (keine Treppen, ein extrabreiter Eingang zum Schlafzimmer und dem Badezimmer, viel Bewegungsfreiraum in der Küche und dem Esszimmer). Ausgedehnte Terrasse mit Holzkohlegrill und großem, überdachtem Essbereich (bequeme Sitzmöglichkeit für 8-10 Personen), eine schöne, von Lavendel- und Rosmarinbüschen umgebene Pergola, ein großer, privater Pool (12 x 4 m) mit Überlauf, Außendusche, eine weitere kleine, etwas versteckte Terrasse mit kleinem Rosengarten lädt Sie zum Sonnenaufgang bei Ihrer ersten Tasse Kaffee ein. Großes Hauptschlafzimmer mit Doppelbett (180 x 200) und großem Einbauschrank, angrenzendes Badezimmer (mit Panoramablick direkt aus der Badewanne), separates WC, direkter Ausgang auf die abgeschiedene Terrasse mit Lounge-Möbeln und dem phantastischen Blick auf das Meer und die Nachbarinsel Arkoudi. Kombination aus Schlaf- und Arbeitszimmer (17 qm) mit zwei Einzelbetten (90 x 200), großem Schreibtisch, kleiner Bibliothek und Ausgang auf die Terrasse. Großzügiges Schlafzimmer mit zwei Einzelbetten (90 x 200), Badezimmer mit WC und ebenerdig begehbarer Regendusche en Suite, extrabreite Türen zum Schlaf- und Badezimmer, alles barrierefrei. Direkter Zugang zu der etwas versteckten Terrasse. Weiße, Hochglanz-Küche mit Herd, Spülmaschine, Kühl-Gefrier-Kombination, Nespresso-Maschine und großer Kücheninsel mit sehr viel Arbeitsfläche für Koch-Aficionados, keine Oberschränke. Ein großes Schiebefenster mit direktem Zugang zur Morgen-Terrasse (Sie können beim Kochen die vorbeifahrenden Segelboote beobachten...!). Kombinierter Wohn-Essbereich (ca. 40 qm!) mit zwei Sofas direkt gegenüber des Panoramafensters mit Meerblick, Sideboard mit großem Flachbildfernseher, großer Esstisch für 6-10 Personen sowie großem, offenen Regal. Kleiner Haushaltsraum mit Waschmaschine, Bügelbrett, Wäscheständer und Regal. Die Villa Lefki, mit ihrem wundervollen Blick über das ionische Meer und seine Inseln, befindet sich 2,5 km außerhalb von Sivota, Lefkada. Wir weisen darauf hin, dass der letzte Kilometer der Strecke nicht asphaltiert ist. We had such a great time at wonderful and spacious Villa. All rooms are designed with simple elegant luxury and all is exactly as shown on the Website. We especially enjoyed the fully equipped large kitchen where preparing meals together is truly fun. The view is mesmerizing and just amazing. Thank you Anna and Mema for being so helpful whenever we needed you! We will be back next year! C'est un peu comme si nous avions découvert un petit coin de paradis. De retour pour la troisième fois dans une villa des Villas Thalassa, pour ce séjour en septembre nous avons eu une semaine avec un météo parfaite.Comme d'habitude l'accueil à été convivial. Comme nous arrivions d'Athènes nous sommes arrivés à la villa après 23 heures. Mema était la souriante pour nous souhaiter la bienvenue et nous faire découvrir la Villa Lefki que nous allions occuper pour la première fois. La grande baie vitrée du salon est comme un écran géant sur la mer et les îles, Dans cette villa tout est spacieux les chambres la cuisine avec son ilot central et la piscine qui doit bien faire 12 mètres de long.merci à toute l'équipe pour ce séjour. What a wonderful place! Beautiful, simple, elegant design with the most stunning views from all rooms - so much so that we left the blinds open to see the most amazing sunrise each morning. A car is a must, as the villa is around 2km along an unmade road. Anna and Eleni made the whole trip so simple. Highly recommended. The only difficulty we had was the internet service provided was painfully slow for most of the day, and there was little in the way of mobile reception. It suited us to be cut off for the week, but it's worth bearing in mind if you need that connection. Thank you for a great week in Villa Lefki. The quality of the villa was fantastic, very clean, spacious, fully equipped and brilliant air conditioning! As all the other reviews mention, the view is extraordinary- worth going just for that. We would highly recommend . Une villa manifique , beaucoup de confort , vue sur la mère. J'écris en français en espérant que certains pourront le lire...nous avons A-DO-RE notre séjour là-bas ! a part les moustiques qui nous empêchaient de profiter de la terrasse à partir de 17h environ :) nous avons aimé la vue époustouflante, le silence, la beauté de la maison, sa fonctionnalité, le ménage en cours de séjour, le confort, la piscine (grande), l'immensité du lit au 1er étage, un seul mini bémol (par rapport à tt ce bonheur), l'accès à une vraie plage (mais on ne peut pas tout avoir :) MERCI ! What a great villa – so spacious (180 square meters! ), beautifully furnished and perfectly equipped with everything one needs (we especially enjoyed the large kitchen and the impressive variety of spices provided for free!). Even with six people occupying the house there is plenty of room for everyone. We had a wonderful and relaxing time at this gorgeous villa – we will come back for sure! Here is one culinary tip: for fresh fish and perfect service go to Yannis’ Ionian Taverna in Sivota (turn left (!) at the harbour), we spent many wonderful evenings on the upstairs terrace – we very much look forward to seeing you again next year in May!!! We had such a lovely time a Villa Lefki and would highly recommend. Great location and everything we needed. We're already planning our next trip back to Villa Lefki next year. Perfect villa! Awesome view! Thank you Anna and Tasos! J'ai passé un très bon séjour dans cette belle villa la grande baie vitrée du salon qui donne sur la mer est mieux qu'une TV grand écran. Un souvenir très particulier pour les soirées BBQ sur la terrasse de la piscine. Merci à Anna pour son assistante avant et pendant notre séjour. We spend a great time in Lefki villa . The villa has a wonderful view and a very nice interior. We found the villa and lefkada very suitable for enjoying active leisure as well as laying back There is a gorgeous private beach , a hidden bay around 400 meters away down hill from the villa. The good thing about the house is that the pictures on the internet really tell you what the house looks like. Service from Jerome and Anna is great. A very nice vacation , excellent villa! Wonderful island and wonderful villa! Very comfortable and fully equiped, great for a long stay. Sensational, exactly as advertised, stuningly beatiful place, wonderful villa. Great facilities and wonderful location. 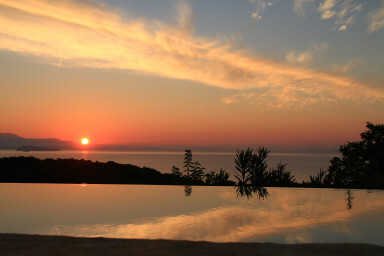 Villa lefki is a wonderful place for very relaxing holidays! The villa has a wonderful view and a very nice interior. We had a relaxing and peaceful stay at the villa. The welcoming and the cleaning service was excellent. Great villa We are a family with teenage kids And we found the villa and lefkada very suitable for enjoying active leisure as well as laying back The villa is an high end accommodation , outstanding . New, all is as described and as in the pictures. Very comfortable, Great views awesome pool. Serenity but not far away from civilization . There is a gorgeous private beach , a hidden bay around 400 meters away down hill from the villa. The location is perfect , for us it is the best in place to stay in lefkada 2 km from syvota bay , with all the boats crowded restaurants in the evenings, bakery, mini market etc' We would also recommend a day trip to the west coast of the island and renting a boat for a day from Nydri and spending an evening in lefkada city The rest of the time we just enjoy the villa . A really super villa with a lovely pool and wonderful views. Limited hot water was a shame (solar powered only) and unfortunately mosquitos were a problem. We had a great time in villa Lefki, The good thing about the house is that the pictures on the internet really tell you what the house looks like. It is a great house , very nice furnished and with a stunning view. The village Sivota is nice for breakfast and dinner. I would book the house again. Service from Jerome and Anna is great.